Kalon Dr. Pema Yangchen greets Himachal Health Minister Sh. Vipin Singh Parmar Education Kalon Dr. Pema Yangchen greets Health Minister of Himachal Pradesh Government, Sh. Vipin Singh Parma today at his residence. Kalon Dr. Pema congratulated him for recent election victory in the Himachal, and being sworn in as Health Minister. She was accompanied by Ngawang Yonten (Additional Secretary) & Dawa Rinchen (Tibetan Settlement officer). 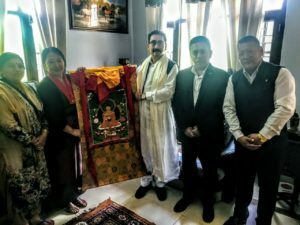 During the meeting, Kalon briefed the new Health Minister on the Medical seats offered by the government of Himachal Pradesh for the Tibetan refugee students. She reported that the scholarship is creating positive impact in the Tibetan community and local communities. On request for continue of the scholarship that includes 4 reserved medical seats, 3 paid medical seats from NRI quota, and to sanction 1 new MD seat, the Minister has assured that he will look into the matter personally.